Apple’s commercials for its mobile devices are usually full of buzzwords, exaggerations and people looking possessed and/or born-again. I personally think they’re a bit creepy. 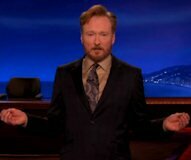 Late night talk show host Conan O’Brien decided to make his own version of the iPad 2 launch video – a more honest one, if you will. I have also embedded a few Apple spoofs and travesties from production company JLE, and they’re perhaps even more true and funny. I recommend that you check them out below – the videos have even made Apple fans laugh out loud.